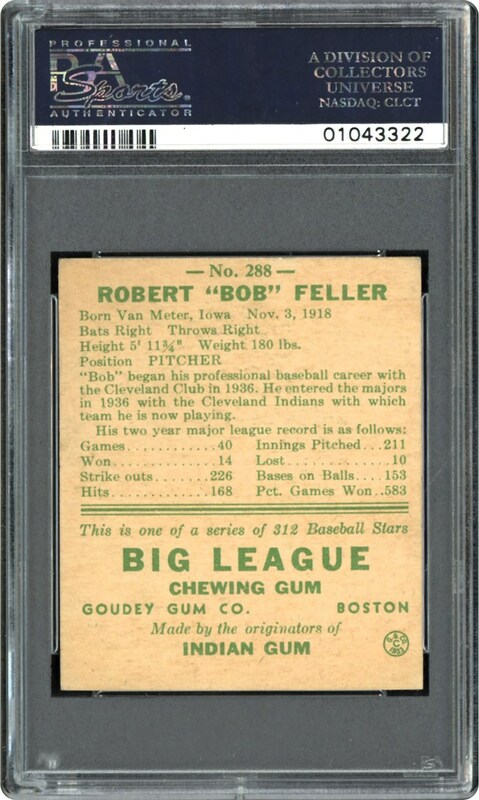 Along with the iconic Joe DiMaggio and Jimmie Foxx , the 1938 Goudey "Heads-Up" set's most desirable and valuable subjects are the two Bob Feller issues that represent his America issued rookie cards. 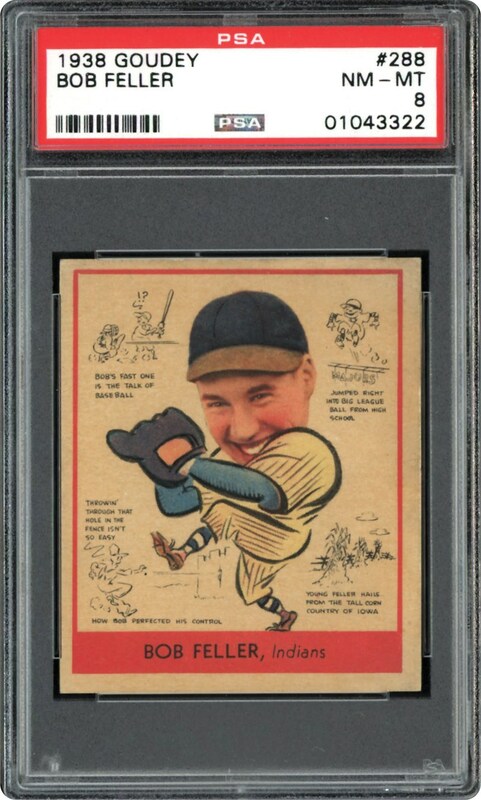 That said, presented here is "Rapid" Bob Feller's #288 1938 Goudey gem in a breathtaking PSA NM/MT 8 holder. One of only nine examples at this hallowed tier, it shares the honor of being the highest PSA graded example on the planet! Had it not been for a 3/4-year Navy stint in World War II, "Rapid" Bob Feller would have easily been a 300-game winner. Yet, even after losing almost four full years of his prime, he still managed to win an astounding 266 games, including six 20-win seasons, 2,500+ lifetime strikeouts and a staggering 348 K's in a single season. He is certainly one of the greatest pitchers in baseball history, substantiating why many avid collectors actively seek his most desirable cardboard gems. This offering depicts a virtually un-improvable Feller image, with vibrant hues emanating from both his portrait image and caricature body. The black print facts and cartoons surrounding the classic pose are extremely vivid with the bold red frame partly favoring the upper left edges. Right-angled corners, razor-sharp edges and a stellar verso complete this remarkable offering that, synonymous with Feller's renowned pitching prowess, stands alongside a handful of other PSA 8's as the "best of the rest!"